LORDS ON BOARDS: WILL THE BRITISH DIRECTORS KEEP THEIR RUSSIAN SEATS? THE AMERICANS TOO? The sanctions programme adopted against Russia to date aims, according to this week’s declaration by US President Barack Obama, at curtailing the capabilities of the Russian government to field men and arms on or across Russian borders; and to penalize individuals and corporations for sustaining the Russian economy while the war in eastern Ukraine continues. For the first time, US officials have declared that every sector of the Russian economy, including investment and financing for industry, urban development, farm production and food supply, are targets. An assessment of the scalpel sanctions against individuals and the list of President Vladimir Putin’s “cronies” can be read here. The legality in European Union and UK law of sanctions against corporations, including banks, has been the subject of adjudications by the European Court of Justice and the UK Supreme Court here. Stealth sanctions aimed at Russian corporate and bank loans, share and bond issues, and sectoral sanctions aimed at publicly listed Russian corporations have been considered here. Yesterday, OFAC published a fresh list of Russian organizations for sanctions. The United Shipbuilding Corporation (USC), a state-owned holding which owns most of the country’s shipyards, producing both civil and military vessels, floating nuclear reactors, icebreakers, and oil-drilling platforms, is a newcomer to the list. So too are VTB Bank and its affiliate, Bank of Moscow. The Russian Agricultural Bank (Rosselkozbank) has also been sanctioned. Previous OFAC sanctions lists and US Treasury releases gave the US government’s reason for the sanction applied either to an individual or to a corporation. This time, Treasury Secretary Jacob Lew said the objective is “to bring the Russian economy to a standstill through a large and broad-based deterioration of Russian financial assets; capital flight that already exceeds all of last year; and a significant increase in Russian borrowing costs.” The reason given by the Treasury for attacking Rosselkhozbank, the supplier of farm credit, food production support, and grain storage, is that the bank “acts as a Russian government agent offering a full range of financial services to clients. With a network of 78 regional branches and more than 1,500 additional offices covering Russia, it has the second-largest regional branch network in the Russia.” No mention that the chief executive of Rosselkhozbank is Dmitry Patrushev, one of the sons of Nikolai Patrushev, former head of the Federal Security Service; currently Secretary of the Kremlin Security Council, who was listed for EU sanctions on July 25. Neither Obama nor Lew has explained why Russian farmers and food processors have become a target of sanctions. Nor is the US sanctions campaign to stop with them. “We are prepared to take additional actions”, Lew added. These are potentially aimed at: the fertilizer required to grow the food Russian soldiers eat; the steel required for the tanks and missile launchers arming the Russian military, the telephone networks through which the Kremlin and General Staff communicate their orders and the Ukrainian separatists call Moscow; and the gold mined to fill the Central Bank and commercial bank reserves, securing economy-wide credits; not to mention the gold required to combat caries in the teeth of Putin’s cronies. With so much agreement on both sides of the Atlantic on what to strike in Russia, and why, and how much is to be gained by a strategy of attacking the Russian economy “to influence Russian behaviour at this point”, what exactly are the former chief of the British General Staff and the Accountant to the Queen and the Prince of Wales doing taking money for directing Russian corporations to act in ways everyone now agrees are wrong for Ukrainians, and a national emergency for Americans too? Sir Michael Peat (No.1) has been the Queen’s Keeper of the Privy Purse, and until 2011 financial advisor to Prince Charles, Prince of Wales. He then took a seat on the board of Evraz, the steel and coal-mining group owned by Roman Abramovich and others. He is paid at least £250,000 a year for this. At the same time he reportedly continues to advise the Duchy of Cornwall, one of the businesses of Prince Charles. Lord Guthrie of Craigiebank (No. 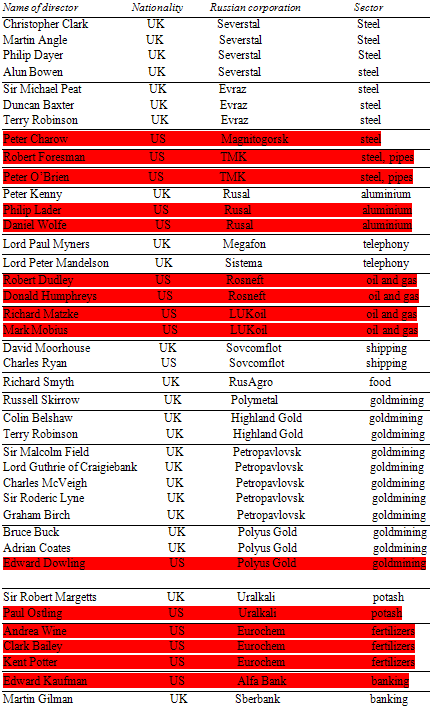 7) is a director at the Russian goldmining company, Petropavlovsk Plc. Before that he was a general of the British Army and chief of the general staff. 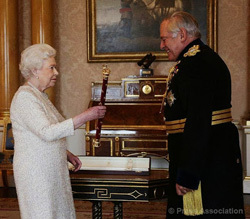 In December 2012 the Queen (right) promoted Guthrie to field marshal’s rank. At the time, he had already been sitting on his Russian goldmine, er directorship, for four years. In the required registration of his commercial interests with the House of Lords, Guthrie claims his Russian directorship ended in 2012. This isn’t what Petropavlovsk Plc reports. Two other knights of the realm also sit on the same goldmine – Sir Roderic Lyne (no. 5) and Sir Malcolm Field (No. 6). Lyne was a diplomat and served as British Ambassador to Russia between 2000 and 2004; he has been on the Petropavlovsk group payroll since 2006. Field, once chief executive of WH Smith, the UK retailer, has been on the same group payroll since 2003. Lord Paul Myners (No. 2) and Lord Peter Mandelson (No. 4) are paid to work as directors of two Russian telephone and communications groups – Megafon which is owned by Alisher Usmanov, and Sistema, owned by Vladimir Yevtushenkov. Sir Robert Margetts (No. 3) is a director on the board of Uralkali, the dominant Russian producer of potash fertilizer. According to the company website, his job is to supervise Uralkali’s development and investments, its remuneration, and its auditing. Now that the Russian activities which these men advise, assist and promote have become targets for allied government sanctions, noone is suggesting they are disloyal to their country or their government for continuing to serve on the Russian payroll.